The Children’s Book has a tremendous solidity to it, a kind of fearless pedantry that I think a reader is bound to find either fascinating and reassuring or tedious, even burdensome–or both, I suppose, at different points in the novel. Mostly, I liked the novel a lot, though I can’t say I loved it because it is an oddly passionless book, resolutely unsentimental. I don’t hold that against Byatt: in fact, I respect her for it. She doesn’t pander to readerly prejudices. Instead, she rewards the persistent reader with her own accumulated knowledge and insight, and with the emotional aftershocks that follow a cerebral, rather than visceral, commitment. One is surprised, or I guess I should just say that I was surprised, at how involved I was, by the end, with her people. The Children’s Book is a panoramic historical novel, a ‘sweeping’ family saga, that reads not at all like those blurb tags might lead us to expect. In this respect, I’m reminded of Wolf Hall, which is not at all what typically passes for historical fiction. But where Wolf Hall is magnificent in its intensely idiosyncratic, sideways approach to history–history as and through character–The Children’s Room insists on the chronicler’s detachment, as well as the cataloguer’s combination of breadth and specificity–it’s history as information management. Backwards and forwards, both. The Edwardians knw they came after something. The sempiternal Queen was gone, in all her manifestations, from the squat and tiny widow swathed in black crape and jet beads, to the gold-encrusted, bedizened, crowned idol who was brought out at durbars and jubilees. The little pursed mouth was silent for ever. Her long-dead mate, who had most seriously cared for the lives of working-men and for the wholesome and beautiful and proliferating arts and crafts, persisted beside her in the name of the unfinished Museum, full of gold, silver, ceramics, bricks and building dust. The new King was an elderly womaniser, genial and unhealthy, interested in oiling the wheels of diplomacy with personal good sense, in racehorses, in the daily shooting of thousands upon thousands of bright birds and panting, scrambling, running things, in the woodlands and moors of Britain, in the forests and mountains of Germany, Belgium, Denmark, and Russia. It was a new time, not a young time. Skittishly, it cast off the moral anguish and human responsibility of the Victorian sages Lytton Strachey was preparing to mock. The rich acquired motor cars and telephones, chauffeurs and switchboard operators. The poor were a menacing phantom, to be helped charitably, or exterminated expeditiously. The land, in places, was running with honey, cream, fruit fools, beer, champagne. This particular section actually runs almost 10 pages, proliferating context, with no reference to the novel’s characters until we rejoin them–or more accurately, until the narrator picks up their threads again, tying them back in. Though I can imagine being bored or annoyed by Byatt’s strategies, for the most part I was simply too interested to be impatient. I did get impatient, sometimes, at the attention lavished on the puppet shows. I understand–or at any rate I assume–that they are integral to the novel’s thematic development in various ways, and that they provide opportunities to deepen character development by adding associations (some literal, some suggestive or allegorical) to what we know about them. I didn’t always get it, though (for instance, I felt rather a dunce about the whole Tom Underground fiasco), and I turn out not to be as interested in special effects in theatrical productions as I am in pots (and thus I reiterate my earlier wish that the novel were illustrated–perhaps the V&A could put out a special edition? or, indeed, here’s a book that might be fabulously developed as a hypertext, or as an etext, complete with animations of the puppetry and interactive maps of the trenches of WWI). **** went into the shelter, to fetch cigarettes. There was a singing howl, and a shell exploded in the trench. A splinter of it took off most of ****’s head. **** took one look, and vomited. Men came running, stretcher-bearers, men with a blanket to cover up what they could, men with buckets and mops to cleanse the dugout. . . . Two days later **** stood up, in his newfangled tin hat, which like most of the men he wore at odd angles, on the back of his head, like a halo. He was not the first, or the last, to be killed by the very skilful German sniper behind the stump of the ruined tree. In the first example, there’s simply no time to recover from the first death before the second one, which is two days but not even two paragraphs later. I thought for a moment, reading about the German sniper, that Byatt was going to indulge in the melodramatic ironies available to a novelist with protagonists on both sides of the conflict. I should have known better. The tone of these passages, also, never changes from the bluntly descriptive, but notice how the perspective shifts in the second example, from “their” joint mission to the pair of walking men, then to our particular man, until his consciousness cannot sustain the story and he is overtaken by the stretcher-bearers. 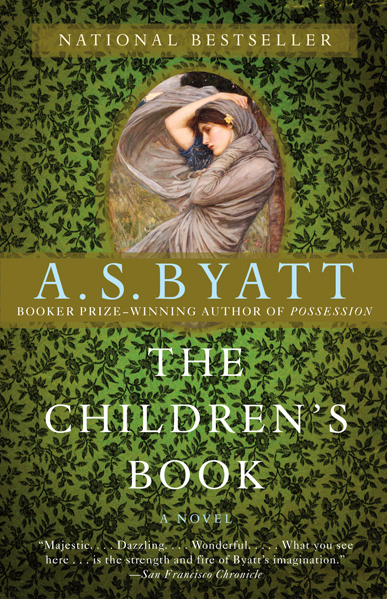 Byatt’s persistent prose can seem artless in its steady march from one statement to the next, but over and over I found that a little close attention showed the steady, experienced hand shaping the clay into a capacious yet subtle and detailed form. Previous Article This Week in My Classes: Grafton, Paretsky, Auden, Heaney, Rushdie! Brilliant review. And an ingenious solution to the problem of spoilers! “Fearless pedantry!” I like it!